Sing For the Red, White, and Blue - sung to "Skip to My Lou"
Sing for the red and white and blue. Dear Old Glory, we love you! Clap for the red and white and blue. Pour red and blue tempera paint onto thin sponges placed in separate shallow pans. Press star-shaped cookie cutters onto the sponges, then onto a piece of white construction paper to stamp on designs. 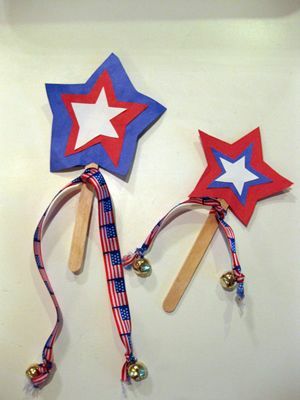 Decorate a piece of blue construction paper with strips of white and red tape plus silver or white star stickers. 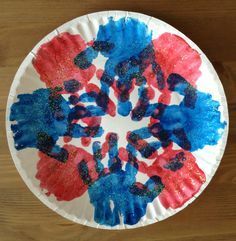 On white paper, use red and blue crayons or markers to trace around a star-shaped cookie cutter and a ruler to create "stars and stripes" designs. Explain to your child that our flag is sometimes called The Red, White, and Blue. Ask her to point to those colors on a picture of the American flag or a real flag. Together, walk around the room searching for red, white, and blue objects. Whenever your child spots one, have her call out the color name. Continue as long as interest lasts.